Thailand’s finance ministry on Monday raised its economic growth forecast for this year to 3.8 percent from 3.6 percent, and upgraded its estimate for export gains, a senior official said. His Majesty King Maha Vajiralongkorn yesterday conducted the transfer of the royal ashes of His Majesty the late King from the Temple of the Emerald Buddha to two royal monasteries for enshrinement. The Fiscal Policy Office is to propose a draft bill which will empower the state to make use of the dormant bank accounts for public interests, but the depositors have the right to reclaim their money. 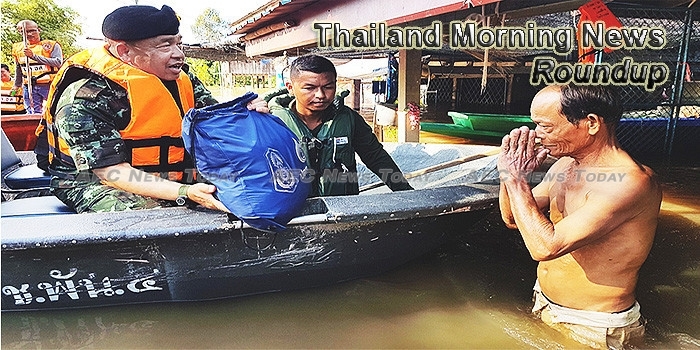 His Majesty the King is concerned about the floods which have affected 23 provinces, and which threaten more, including Bangkok, and has requested the government to prepare both rescue and rehabilitation plans for victims, Prime Minister Prayut Chan-o-cha said Monday. Thailand officially ended a year of mourning for its late King Bhumibol Adulyadej on Monday, marking a return to colors for some after a monotone year during which many wore black from head-to-toe out of respect for their revered monarch. The Deputy Prime Minister for Security Affairs and Defense Minister has ordered military commanders to help citizens affected by flooding as well as the rehabilitation effort once waters subside. Water discharges to begin tomorrow affecting designated areas as volumes near 2011 levels. The Stock Exchange of Thailand (SET) has set a target for annual market capitalisation for IPOs and secondary offerings at a combined 550 billion baht per year to maintain market leadership in Asean. Richard Liu (Liu Qiangdong), 43, founder and CEO of JD.com, sat down with Suthichai Yoon, The Nation’s |co-founder, recently in his headquarters in Beijing, to |discuss his plan to make Thailand the e-commerce hub for Southeast Asia. Thailand’s export sector is receiving benefits from the increased poultry consumption in Japan, as Japanese consumers have confidence in the quality and safety of Thai chicken products. Refinery company Thai Oil has set aside an investment budget of Bt8.9 billion through 2019 with a view to expanding its production capacity to 400,000 barrels a day. The army’s Ordnance Department has been assigned to look for convicts detained in prisons on charges of illegally making guns from imitations to be trained to assist work in the Defence Ministry’s defence industry, defence spokesman Lt Gen Kongcheeop Tantrawanich said on Monday (Oct 30). The Tourism Authority of Thailand (TAT) is in discussion with Thai airlines nationwide to boost air access to key destination across the country in time for the upcoming peak season arrivals. Thai construction company TTCL Pcl said on Monday it plans to build a $2.8 billion coal-fired power plant in southeastern Myanmar. Rich Sport Plc, the maker and distributor of Converse shoes in Thailand, is planning to cut production capacity at its factory in Thailand by half next year in line with Converse global policy. Monday review: What happened while Thais were mourning the late King? While Thailand last week was overwhelmed by mourning for the late King Bhumibol, other significant issues seem to have been overlooked, such as serious flooding, the arrest of a former lèse majesté convict and use of the junta’s absolute power. Loy Krathong revelers have been requested by the police to refrain from playing fireworks on the night of Loy Krathong Day this coming Friday to prevent possible fires. The Ministry of Foreign Affairs has revoked four passports, including two diplomatic passports, of former prime minister Yingluck Shinawatra on October 25, said Pol Gen Srivara RangsipramanaSkul, the deputy national police chief, on Monday. The Highways Department will close the flyover linking Vibhavadi Rangsit road and the Don Mueang airport from the night of Nov 6 for demolition to make way for the construction of a new airport access bridge.